If you’ve been following me and my blog for a while, you might recall that our family has been in a nearly four year process to adopt a child from Honduras. Great news! We have suddenly found ourselves in the home stretch and will hopefully be traveling for our first court date very soon (or so we’re told). International adoption is an expensive process. The longer it takes, the more the expenses add up. We’re going out on a walk of faith and asking all of you to help us get finish this process and bring our princessa home! 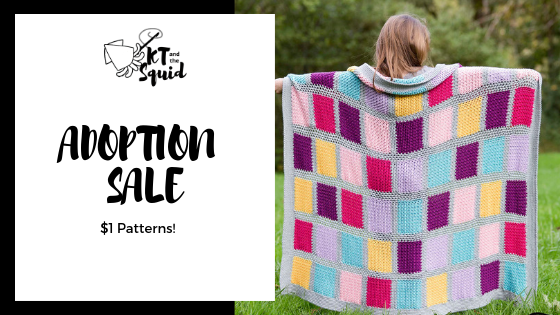 All of my patterns will be on sale for just $1 through April 9th, 2019. Just $1 – for any pattern! Looking at my social media and blog stats, if everyone who sees this post purchases a pattern for themselves or as a gift for a friend, we’ll have a fully financed final adoption process. If, for some reason, our adoption does not become a reality. All of the proceeds from this sale will be donated to Worldwide Heart to Heart Ministries, the organization currently caring for our kiddo. You’ve been great through the years and I’m looking forward to many more years of sharing with you all. Now go shop! Thank you and God Bless. Click here to see all of my patterns – now on sale for $1. If you live in a country subject to a VAT tax unfortunately I am not registered to handle this tax. You can shop my Ravelry shop HERE and use the code ADOPTION for 60% off instead.